30 day Ansonia wall clock c. 1901 Dimensions:32" tall with a 12" dial diameter incl. bezel. Maker/Mfgr./Author/Artist:Ansonia Clock Co., New York, NY. Condition:Excellent-restored (dial recovered; case refinished professionally; running perfectly.) Circa:1901 Materials:Pak case; brass movement; paper over zinc dial. 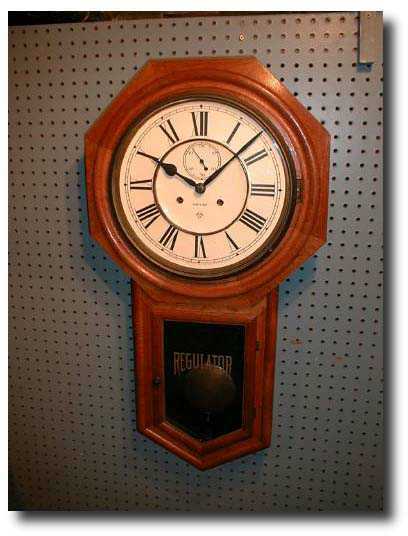 Description:Thirty-day wall regulator clock. Ansonia Clock Co. in New York. The Oak case has no breaks or cracks, and it has been professionally refinished to a lovely medium brown shade. The dial has been recovered and the movement runs perfectly and keeps time! Ansonia named this model-The "Office", and gave it a seconds dial to add to the interest and "action" of the clock. It is a 30-day "long-drop" (to use the term applied to clocks with longer pendulum housings) which are not as frequently found on the market as their 8-day companions.